Chicago Bears' tight end Trey Burton had a quiet 2017 season, so you may be wondering why you've been hearing his name a lot as a potential breakout candidate. After all, Burton only caught 23 of 31 passes for 248 yards and five touchdowns. What you may not see by his stats is how he filled in nicely for Zach Ertz when he missed a few games for Philadelphia. In Week 9, Burton caught only two passes for 41 yards and one touchdown. That was against a tough Denver defense. He also filled in for Ertz in Week 11, catching four of seven targets for 42 yards. When Ertz missed Week 12, Burton exploded for 71 yards and two touchdowns on five receptions. Those few games were enough for the Chicago Bears to take a chance on him in the offseason, signing him as a free agent. Burton is currently being drafted at the beginning of the eighth round (8.01) in 12 team PPR drafts. He is the 9th tight end off the board. His draft position over the past month has seen hovering around the end of the seventh (7.12) to the beginning of the eighth (8.03). It seems like Burton will level off around this area. 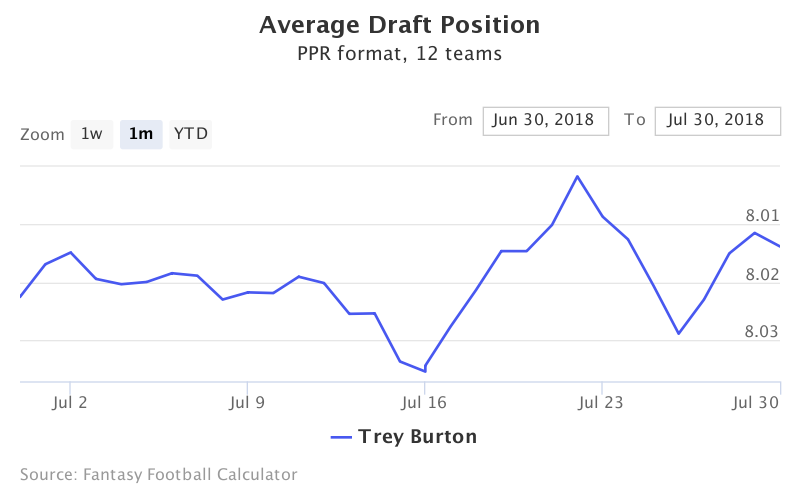 If you take a look back further in his ADP, you can see that fantasy owners have seen the potential in Burton. He had originally been drafted in the 13th round in mid-April until the news came out that he was being signed by the Bears. By now if you've been following the Bears or Trey Burton in general, you probably have heard about Matt Nagy's hope to make Burton a Kelce-like tight end in Chicago. Nagy thinks that Burton can create mismatches in the passing game, allowing him to play more like a receiver than a tight end. If Burton is anything like Kelce, he will be in for a huge chunk of the passing offense. The Bears have also brought in a lot of wide receiver skill this offseason, drafting Anthony Miller and making one of the biggest splashes in free agency: Allen Robinson. They also signed Taylor Gabriel, who had some decent seasons behind Julio Jones in Atlanta. With Robinson, Gabriel, and rookie Anthony Miller, opposing defense may have their hands full already. Burton can be that mismatch that gives QB Mitch Trubisky a decent midfield target for some big games. That being said, it is unknown how the Bears' offense will perform in 2018. The nice thing is that Burton is not a high draft pick, so it shouldn't hurt fantasy teams too much if they need to look on the waiver wire for a new TE. Burton is an early eighth round pick, going as the ninth overall tight end in 12-team PPR formats. He is a bit of a high risk, high reward player. 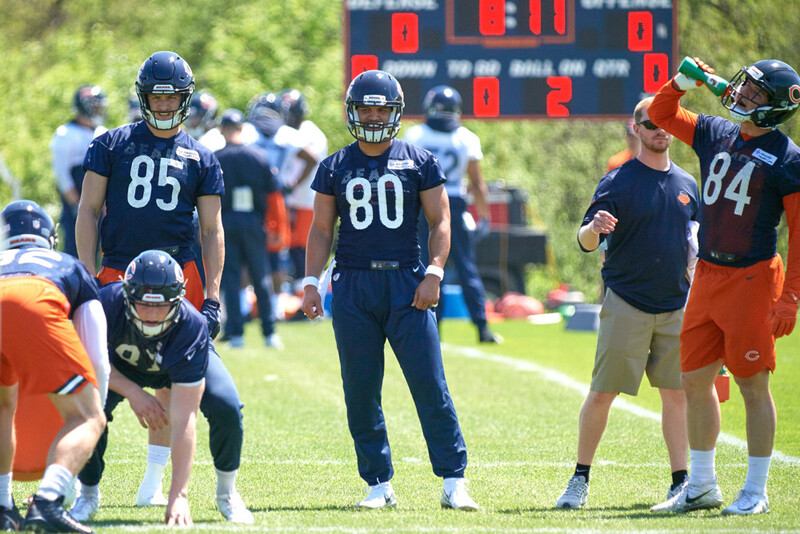 On the one hand, the Bears' offense could be a lot better than previous years, allowing Burton to use his size to outmatch the opposing defense. Yet on the other hand, we have seen very little of Burton and of QB Mitch Trubisky. If Trubisky or the Bears' offense can't get going, it may be a rough year for Burton.